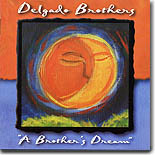 Those underrated musicians from East L.A., The Delgado Brothers, have been recorded far too infrequently. That's what makes their new CD, A Brother's Dream, such a treat. It's this month's Pick Hit. Our chief soul reviewer is raving about the new CD from vocalist Charles Walker, calling it one of the year's best. Read all about it in this month's Surprise pick. Two of the greatest blues CDs ever recorded are included in this look back at Magic Sam's Delmark albums from the 1960s. West Side Soul and Black Magic are covered in this month's Flashback feature. This month's What's New section includes new CDs from Robert Cray, Buddy Guy, Michael Burks, Sonny Landreth, Maria Muldaur, Jamie Wood, Janiva Magness, Bob Margolin, Harmonica Shah, Otis Taylor, Little Chris and the Night Crawlers, Michael Hill's Blues Mob, Canadian Charlie A'Court, and more. One of our top reviewers also gives a preview of the upcoming film series commemorating the Year of the Blues.